Here’s something that we can do that I never thought would be a part of the business, but has turned out to be! When placing a machine in a factory environment, you need to pretty accurately locate the bolts that will hold it down. On a couple of occasions, we have printed 5 ft wide prints to be laid out on the floor for marking the bolt locations. We have printed on a polypropylene film, which doesn’t stretch, and this makes a great template for machine location. 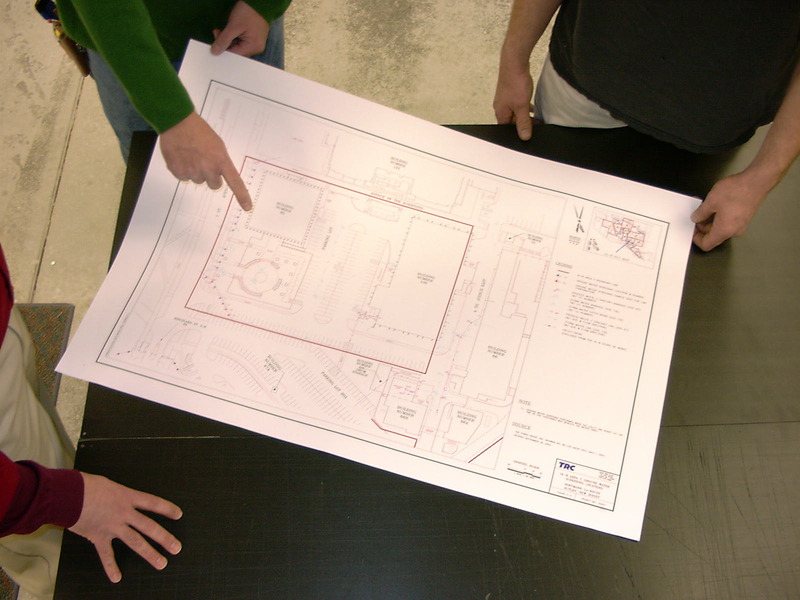 We use a 60″ graphics plotter that will accurately reproduce very large pieces. If you need wider than 60″, we can print in strips with alignment marks that allow pieces to be set down accurately and then taped together. This entry was posted in large format printing and tagged bolt location template, machine floor template. Bookmark the permalink.